Give a little feedback in assets! Like and comment or subscribe to an asset to receive notifications. Allows each participant to show their appreciation for the asset. Just click the heart! Interested in following the asset as it is added to other walls, rooms and more? Subscribe to the asset and receive notifications when others comment on it. You are automatically subscribed to your own new content. Notifications are based on the digest email notification you choose. Tip: Want to receive email notifications more or less often? Go to Your Profile and update your notification settings. Comments allow participants to discuss the asset with others in the room. The Timeline will show below the comment box and includes updates to the asset, responses and how the asset is being used on other walls. Hit "enter" before you were finished with your comment? 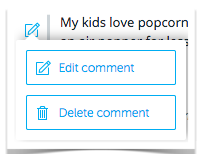 Don't worry just "edit" or "delete" your comment. Tip: Did you know you can also @Mention another room participant in the comment section? Follow this link to learn how to @Mention.